Magabala is a Broome-based Indigenous publisher. 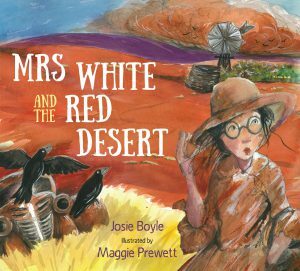 It publishes Bruce Pascoe, the award-winning author of Black Emu (for adults) and Fog a Dox, Seahorse and Mrs Whitlam for children. 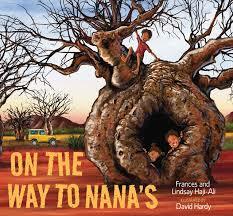 Magabala’s Greg Dreise’s Mad Magpie has just won the Indigenous category of the national Speech Pathology awards. Deadly D and Justice Jones by David Hartley and Scott Prince is an appealing series which I’ve reviewed for the blog previously and Brenton McKenna’s graphic novels, Ubby’s Underdogs are full of appeal. 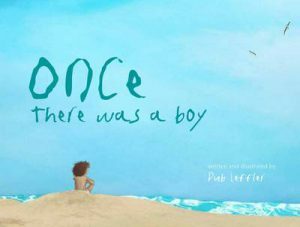 And one of the most beautiful picture books I’ve ever seen is published by Magabala – Once There Was a Boy by Dub Leffler. A suburb new picture book is Big Fella Rain by Beryl Webber. It traces the natural world’s wait for rain in northern Australia. The illustrations by Fern Martins are impressive and one appears above as the feature image for this post. They are lovely, evocative works of art. The red cover of Mrs White and the Red Desert by Josie Boyle, illustrated by Maggie Prewett, represents the overshadowing power of the desert sand to explain in an amusing way why the children’s homework is always smudged with red. This is a highlight in Magabala’s list. The first picture book from Magabala’s Indigenous Creator Scholarship is Molly the Pirate by Lorraine Teece, illustrated by Paul Seden. 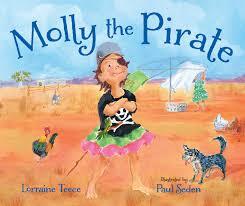 Molly lives far from the sea but imagines she is a pirate. Paul Seden takes the challenge modelled by the lively text to create vibrant, gloriously-coloured illustrations. He also does a great job with camera angles, particularly from above and below the hills hoist clothes lines. 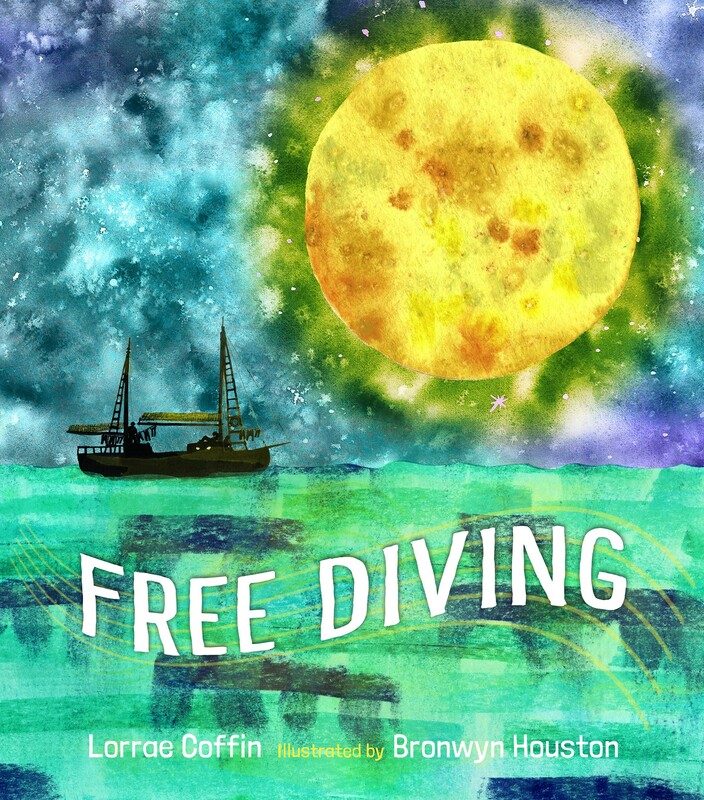 Based on the song by Lorrae Coffin, Free Diving looks at the role of Indigenous free divers. It is a poignant insight into history, illustrated by Bronwyn Houston. Two board books for the very young from the new “Young Art” series are At the Zoo I See by Joshua Button and Robyn Wells (the team behind Steve Goes to Carnival) and At the Beach I See by Kamsani Bin Salleh, who uses black linework with wash backgrounds. 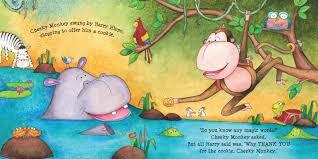 Concept picture books play a huge part in shaping a young person’s perceptions. They are capable of unlocking an inquisitiveness that hopefully sticks around for life and are crucial for developing critical thinking, reasoning, and logic. However, important educational concepts need not be strictly didactic and dull as these entertaining picture books clearly display. 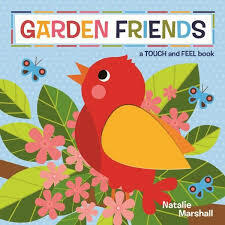 Garden Friends by Natalie Marshall is a Touch and Feel board book, sturdy and bright in appearance in the same vein as the That’s not my… series. 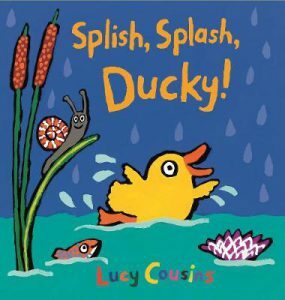 This one directs 0 – 3-year-olds to experience their tactile investigations within a garden setting using short verb orientated phrases – ‘Duck is quacking!’ It’s joyous and sensual and a nice shift from the usual ‘touch and feel’ concept. 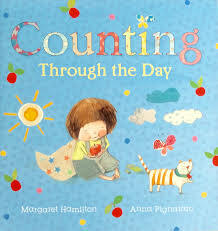 Counting Through the Day by Margaret Hamilton and Anna Pignataro escorts pre-schoolers through a typical day from sunrise, to breakfast, to visits with Nanna and finally back off to bed. 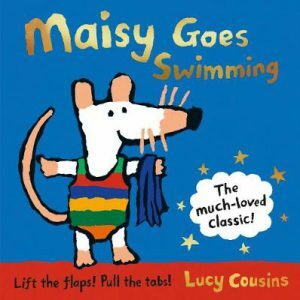 Along the way, our young protagonist gently encounters many fascinating objects and situations from two sturdy feet to five broody hens and even ‘thousands of raindrops falling from the sky’. And as children are wont to do, they count each and every one of them. Hamilton’s gently rhyming verse and affecting choice of counting objects harness a child’s every day pleasures, highlighting the world around them: their toys, meals, the weather and so on. Numbers 1 – 11 are shown numerically and in words while Pignataro’s combination of drawn, painted, and collage illustrations are simply marvellous. The end pages alone will provide hours of delight and interest. 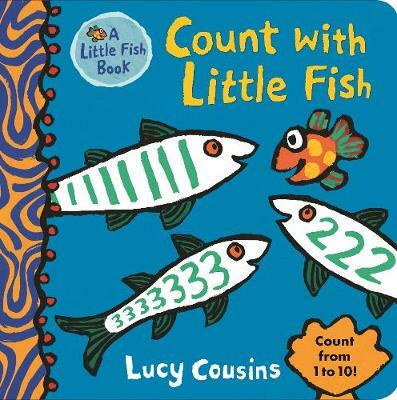 Counting Through the Day is as much about story as it is about learning to count. I love that readers are taken past the obligatory ‘10’, and are introduced to 11, 20, hundreds and even millions, exposing young minds to a universe of infinite possibilities. Easy to grasp and absolutely beautiful to enjoy. For someone whose spatial awareness is not as sharp as it could be, the next two picture books are a real boon. They encourage an understanding of the relationship of objects to oneself and in ones world in a clever and entertaining way that ensures high levels of reader investment and interest. 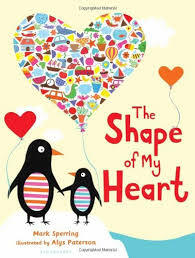 The Shape of My Heart by Mark Sperring Illustrated by Alys Paterson is a board book sized banquet of colour, shapes, and rhymes; images guaranteed to captivate 0 – 5-year-olds. This is no ordinary ‘this shape is a…’ book. It expands the notion of appearance and form by depicting the most obvious shape to start with – you and me. 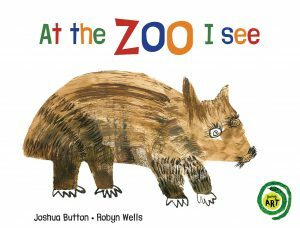 From there, readers are shown the various shape of parts of our anatomy (eyes, mouth, feet) the environment in which they live (sun, houses) and those shapes that inhabit the world with them (birds, vehicles, creatures in the zoo) and so on. I love how the shape you can hear with (ears for instance) leads to a myriad of other shapes that make up our existence. 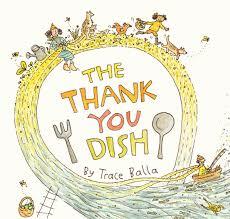 Sounds confusing to describe but not to behold and read thanks to Paterson’s cheerful and shapely illustrations. Reminiscent of Mem Fox’s Where is the Green Sheep? in parts, The Shape of My Heart combines visual literacy, introduction of sounds, and rousing vocabulary whilst neatly implying that everything that shapes our lives fits within our hearts and you can’t get any more spatial than that. Highly recommended. What Could it Be? 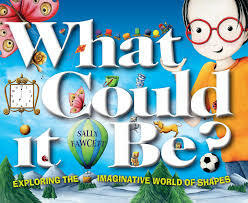 by Sally Fawcett is a fascinating picture book initiative combining the best bits of storytelling, creative stimulation, and subliminal learning. Displayed in complementing double page spreads, Fawcett gently introduces young readers to some well-known geometric shapes and colours. Pre-schoolers and early primary schoolers may already be loosely familiar with shapes such as circles, ovals, and even octagons. They are probably discovering the mysteries of an artist’s palette, as well but in What Could it Be?, they are challenged to delve deeper, look more closely and investigate the world of possibilities surrounding them. 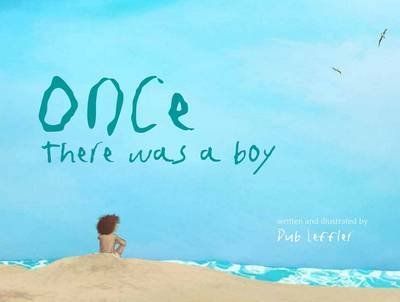 With the help of, a young boy named Max, readers are prompted to answer the ‘what if’ inspired notion to think outside of the box and tap into their creative souls. Each page of story is gloriously illustrated by Fawcett who cleverly secretes dozens upon dozens of obviously hidden aspects in each scene to be discovered by roving little eyes. 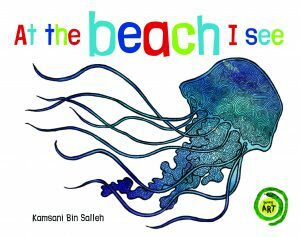 I say obvious because this picture book adventure serves to show that every conceivable form, colour and object in our worlds are there for us to find if we just look hard enough and perhaps use a little imagination. Children will delight in the seek and find quality of What Could it Be?. 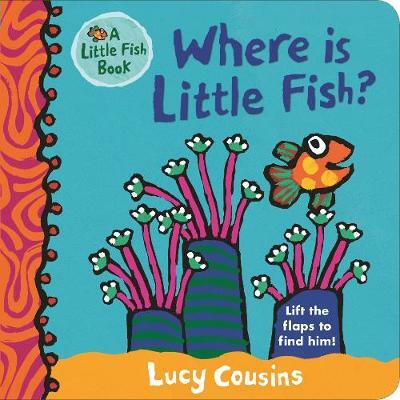 In addition, this book has far-reaching usefulness in homes, schools, and early learning centres. I see a future for it in home schooling, too as it fosters a genuine exploration and appreciation of the world around us. 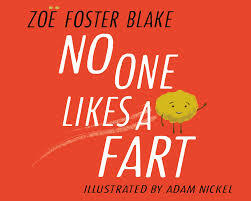 At the book’s conclusion, children are invited to go one-step further and are encouraged to think, experiment, create, and share for themselves. Unleash your child’s creativity with this one! I’m not sure how or why but I’ve still got many of the board books of my childhood and now, those from my daughter’s early learning days. Their very construction may have something to do with standing up to the test of time. Maybe, I just can’t bear to part with them because of what they represent, an intensely intimate time of shared firsts, revelations, and discoveries. Board books not only symbolize these never to be repeated phases of a child’s development but also crucially supply growing intellects with those first initial stepping stones towards visual and verbal literacy. Here are some fun newbies to add to your collection. Big Books by Natalie Marshall. I absolutely love the look and feel of these large format board books. 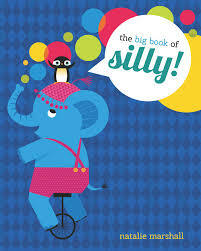 The Big Book of Silly allows pre-schoolers to revel in the surreal and silly, like a rhino eating three hundred jellybeans before bed for instance (however perhaps this is not as silly as it sounds to a child). 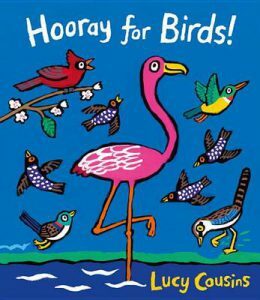 As with the Big Book of Happy, it is illustrated with loud colour-filled pages of big bold characters prompting very young readers to question their own happy and silly moments. Too much fun to pass up. 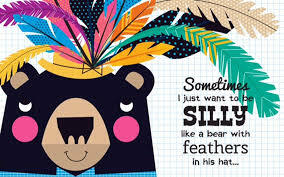 Lisa Kerr is another Aussie author whose Cheeky Monkey Manners builds on her Cheeky Monkey series character and uses vibrant full-page colour to harness young attention spans. 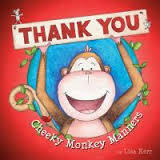 Cheeky Monkey is not so much rude as ‘unknowing’ and with the help of his extremely tolerant jungle pals eventually comes to understand and use his ‘please’ and ‘thankyous’ correctly. 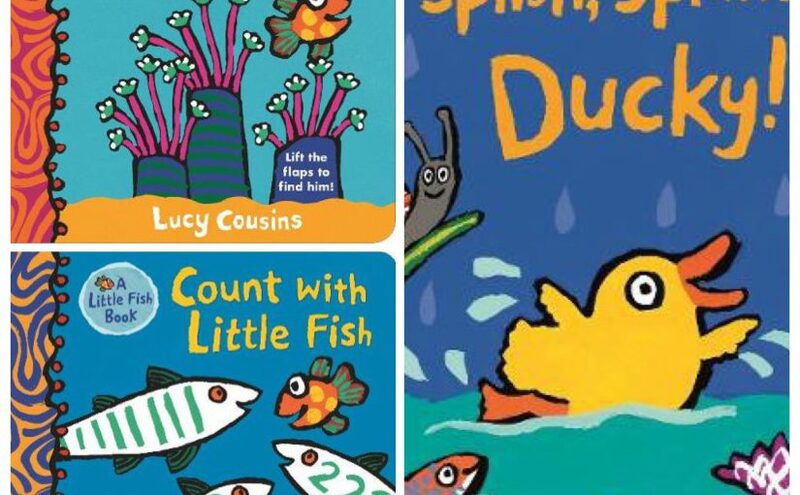 Repeating scenarios and a square compact size makes these books idea for introducing and enforcing manners in pre-schoolers. 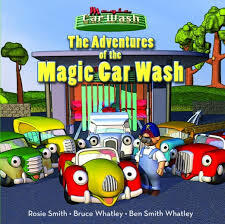 Another vibrant set of books perfectly suited for fledging imaginations is the Magic Car Wash series, a family collaboration by Rosie Smith, Bruce Whatley, and Ben Smith Whatley. 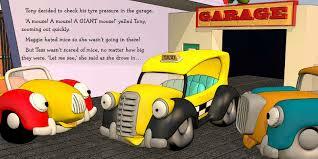 Kit the mechanic owns a car wash and small but eclectic fleet of vehicles in the town of Tyre Flats. (Don’t you love the connections?) The thing is, whenever the cars drive through the car wash, magical things happen; front and back ends mix and match resulting in some curious combinations…and adventures. Beginner readers will get a real buzz of out these Transformers meets Cars tales. They provide the idea vehicle from which to explore concepts of fear, friendship, spatial awareness and direction, and the benefits of working together to achieve great results. 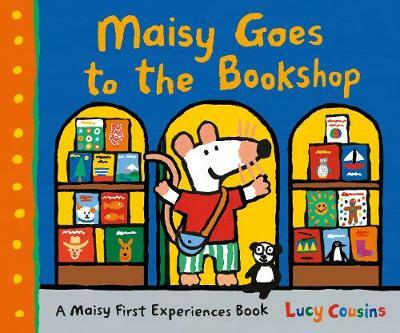 I adore the simple colourful graphics, exploration of language and brilliant little twisty endings of these books. Robust (super thick glossy pages means these books will last for a long time on the book shelves of even the most active readers) yet cute enough to win over boys and girls, and hopelessly appealing, the Magic Car Wash series is another great example of board books on offer from The Five Mile Press May 2015. 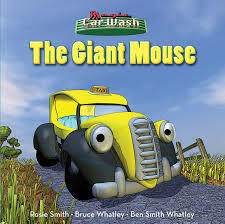 Titles include The Giant Mouse, The Runaway Car and Red’s First Fire. 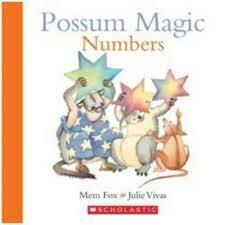 Lastly but not least (there are still so many to fawn over) a little bit more magic…Possum Magic. 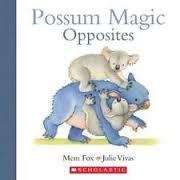 Mem Fox and Julie Vivas have joined formidable forces again to develop a series of beautifully bound board books aimed at pre-schoolers and based on their perennial picture book favourite, Possum Magic. Animals led the way, now followed by, Actions, an exploration of ‘doing’ words. Words that inspire action in various modes are lovingly represented by Vivas’ cheerful illustrations. Familiar yet brimming with new eye-catching detail, each spread features two different verbs demonstrated by those endearing Possum Magic bushland characters we’ve come to love. 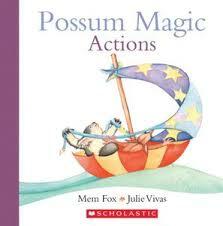 If you like eating (lamingtons), reading (in comfortable places) and dancing (under starlit skies), you will love Possum Magic, Actions and so will little ones aged 0 – 4 years of age. Here’s another hot off the press. 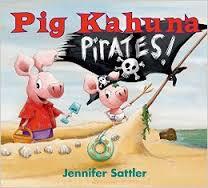 Pig Kahuna Pirates! 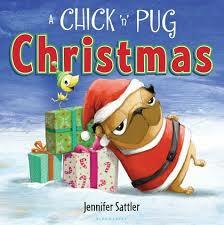 by author illustrator, Jennifer Sattler just corkscrewed its way across my desk. This chunky little board book follows in the wake of Pig Kahuna and Sattler’s previous Chick ‘n’ Pug picture book creations. Goofy, cutesy characters bounce through seemingly parochial situations yet inspire adventure and genuine expressions of love. The porcine brothers, Fergus and Dink spend a day at the beach together caught in a world of pirates and brotherly disagreement until Fergus realises the value of his baby brother. Heavily textured illustrations ably capture the emotions and the ambient beauty of the day. 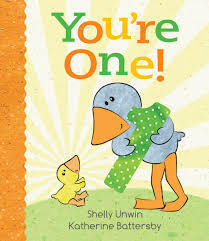 A great board book addition for those with siblings under 5 years old.